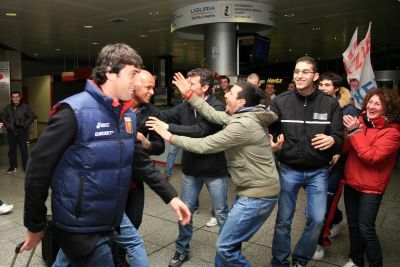 Today a shock went through the Genoa-family. Our topscorer and most popular player Diego Milito got injured Saturday-night during the match Argentina-Venezuela (4-0). Diego got injured at his right thigh leg and probably the muscle is teared. Genoa wants our striker to come back from Argentina as soon as possible to know more about the injury and to start the recovering as soon as possible. The first diagnose says that Diego can not play the next 3 or 4 weeks, while the derby is in 5 weeks. In the meanwhile Olivera, Jankovic and Palladino can substitute Diego as central-forward just as during the last injury of Milito when Genoa did win all 3 matches against Chievo, Torino and Lecce. 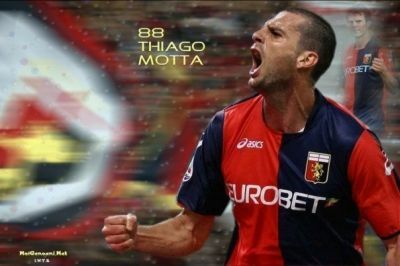 Thiago Motta wants to stay with our Genoa ! Our Brasilian central midfieldplayer Thiago Motta is healthy again and can play next week against Reggina. This week the agent of Thiago Motta told the press that our playmaker wants to play with A.S. Roma in the future. Our president Enrico Preziosi reacted furiously because Thiago Motta just 6 months ago signed a 4 years contract with Genoa after many clubs refused to give him a contract because of his fysical problems. 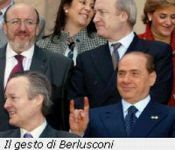 Preziosi took the risk and he is te winner, but of course does not want to lose such an important player after only 1 season. The next day Thiago Motta, his agent and A.S. Roma said sorry to Preziosi, while our Brasilian player also said that he wants to stay with Genoa. This weekend 5 Genoani play with their National Team to reach the World-Cup in South-Africa next year. Diego Milito plays with Argentina against Venezuela (and Wednesday in La Paz, Boliva on top of the world), Bosko Jankovic plays with Servia in and against Romania, Sokratis Papastathopoulos defends Greece in Israel, Ivan Juric plays Wednesday with Croatia in Andorra and our talented defender Salvatore Bocchetti (who refused this week to play with Juventus next year) is selected for the first time in the Squadra Azzuri to play today in Montenegro and Wednesday at home against Ireland. All the other matches, after tomorrow in Cagliari, start Sunday-afternoon at 15.00 hours. 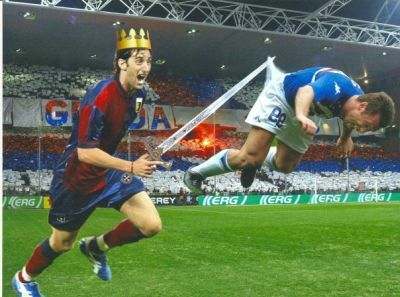 Till yesterday Genoa was unbeaten at home: 8 victories and 4 draws. Also yesterday the team of Mr. Gasperini was the best team in the field with 58% ball-possession, 7-2 advantage in corners and 16 against 8 shots on the goal. Nice numbers, but they don’t count. All that counts is the result of 0-2 by goals of Ibrahimovic (off-side ?!) and Balotelli (did it pass the line ?). Maybe this is the difference between an European topteam like Inter and a club like Genoa that played 3 years ago in Serie C-1. Genoa created at least 5 big chances, but did not score. On the other hand if we put on our red and blue glasses also Inter did not score a regular goal because Ibrahimovic in the 2nd minute was in off-side position when he scored and the ball of Balotelli in the 61st minute never completely passed the goalline. Of course it is possible to loose against the Champions of Inter, but the most pain of yesterday-evening are the yellow cards of Biava, Ferrari and Motta that all 3 can not play next Saturday at 18.00 hours in and against number 7 Cagliari. A very important match to reach European football at the end of the season.